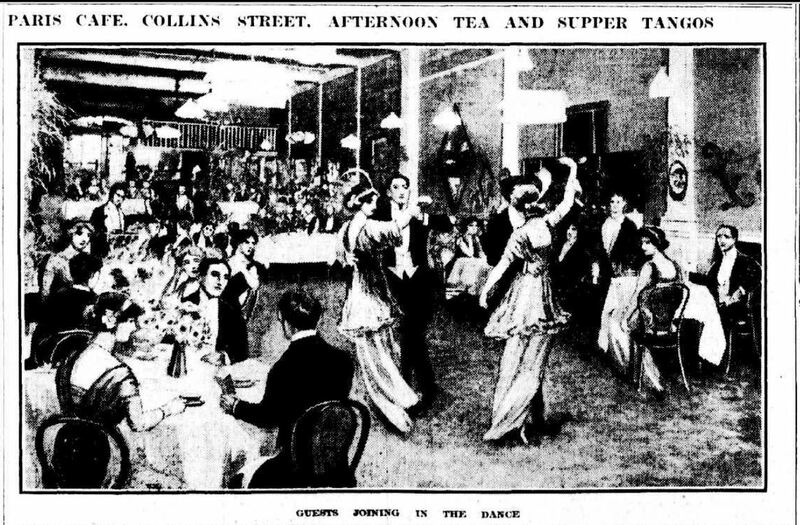 For the past three or four weeks “Tango Suppers” have been in vogue at the Paris Cafe, in Collins street and have proved such a success that Mr A. J. J. Lucas, the proprietor, has been prevailed upon by his patrons, to extend the function to the Afternoon Tea Assemblies also. The first of the series will begin on Tuesday next, at 3.45 p.m., and a charge of half-a-crown a head will be made for the afternoon tea and entertainment. The Tango Suppers will comprise a good concert programme in addition to the fascinating new dance. At the Tango Supper Parties guests generally order their tables and any wines they may require a- few days in advance, as everybody knows that wines cannot be obtained after 11.30 p.m. This practice will continue to be strictly observed by the management. Special artists, including Mr Boddam-Whetham, from London, and Miss Irene Aubrey, have been engaged to lead off and execute the more intricate figures of the Tango and Maxixe Bresillienne, until the guests acquiring a knowledge of the steps may rise and join in the enjoyment of a dance which, contrary to general opinion, is not so difficult to learn as most people imagine. Not everyone agreed. The German Kaiser forbade officers in the military from dancing the tango while in uniform. Queen Mary banned it from the palace. The Pope called it “an outragious, indecent, heathen dance, which is an assassination of family and social life”. In the USA, the tango was denounced by no less a person than the Vice President. The Boston Musicians Protective Union announced its opposition to what it called “freak dances”. The local government decreed that dance halls would remain fully lighted, and a police matron would be assigned to each dance hall. A member of the Massachusetts legislature introduced a Bill that called for the tango to be banned, along with other morally dangerous dances. “Dancing at public dances, entertainments or gatherings of the so-called tango, lame duck, Argentine chick flip, bunny hug, grizzly glide or any dance participation in which is not conducive to public morals shall be prohibited,” the Bill read. Penalties were to be $50 for a first offence and six months gaol for a second. Despite the collective outrage, the tango was unstoppable. It wasn’t limited to the social set. In London, there were reports of a tango dance and fried fish supper held outside a fish shop in the Fulham Road. Music was supplied by a piano organ. Dancing at afternoon tea parties was not unusual at the time, so the advent of the “tango tea” as well as the “tango supper” was, perhaps, not remarkable. In Melbourne, The Argus was sniffy about it. “For those who like Tangos with their meal, the innovation should supply a long-felt want,” the paper said. Reporting on the first tango supper, the paper felt that the local version of the dance, “shorn of all its objectionable features” was so mild that “one could take one’s maiden aunt”, despite the fact that some dare-devil ladies smoked cigarettes. The report, later picked up by newspapers around the country, suggested that the attempt to create a carnival atmosphere fell somewhat flat despite the fact that some young gentlemen “blew whistles, pelted each other with bread, banged on the table with knives and generally endeavoured to persuade themselves that they were having a right merry evening”. With the outbreak of World War I enthusiasm for the tango cooled somewhat, although it enjoyed a revival in the 1920s. There are now various versions accepted as part of the ballroom dancing repertoire.